This is a slightly delayed summary of the sauropod symposium on day 2 of IPC4, following sessions the previous day on vertebrate taphonomy and diversity and extinction in the fossil record. This is also the final of these little summaries, and for that I apologise – my laptop is a bit kaput atm, and needs power sockets to run and which were not available in some of the rooms. I might be a little cheeky and ask a couple of the attendees to write personal summaries for here, but we’ll have to wait and see! 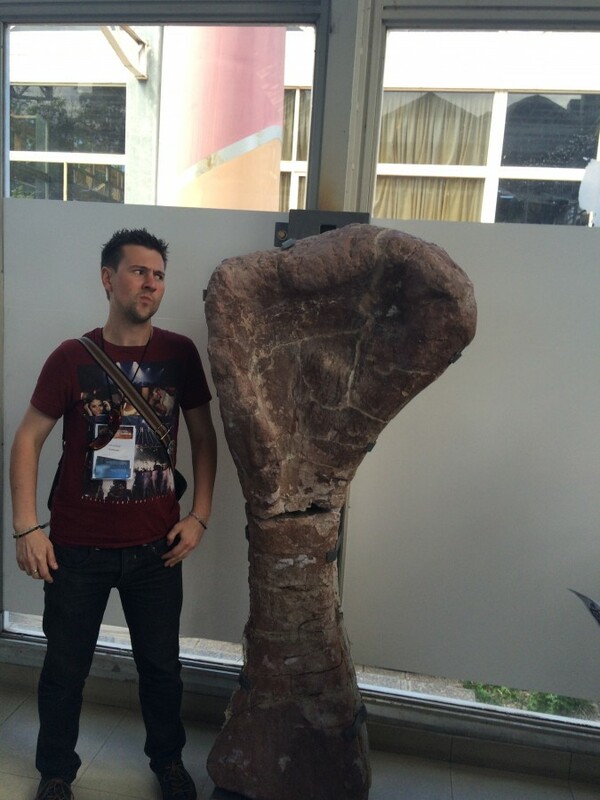 Make sure you’re keeping a check on Palaeocast too, as Dave has been reporting non-stop from the conference. On to sauropods, those giants of the Mesozoic! Martin Sander launched right into the meat of things discussing the latest advances in trying to understand the physiology of gigantism in sauropods. A large team of researchers have been working on a cascade model of evolution featuring traits, selective advantages and feedback loops that lead to increasing body size in sauropods. John Frominos switched modes completely to his investigation of the comparative function of vertebrae between sauropods and crocodylians. It seems that generally, concavo-convex vertebrae in crocs don’t offer much advantage in terms of flexibility, so the same may be true for sauropods. This talk was of particular interest for me, as atoposaurid crocs are some of the first crocodyliforms (early non-crown group crocs) to have procoelous vertebrae (with a convex front edge and concave back edge). Jorge Calvo filled in with a replacement talk to describe some new remains of Futalognkosaurus from the Late Cretaceous of Argentina. Turns out it’s just a really cool, massive dinosaur, and among one of the largest and most well-known of sauropods. Bernardo J. González Riga described new sauropod remains from Mendoza Province, and new information on the evolution of the sauropod pes (foot). Two new titanosaur species with unusual characteristics of their feet were mentioned, which is great as it sheds light on the evolution of locomotion in these big boys. Bernardo was also cool enough to take us to his lab to see the amazing new specimens, and provide wine and empanadas, so on the off chance that he reads this – thanks Bernardo and everyone else! One of the leg bones of one of the new dinosaurs! A very humerus photo. 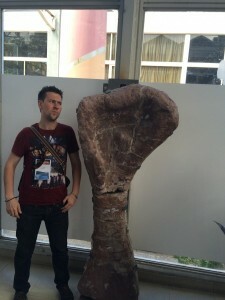 Matthew Lamanna, one of the chaps involved in the recent discovery of Dreadnoughtous, described some new Moroccan sauropods, and their implications for sauropod ecology and diversity in Africa. He provided the first evidence for theropods preying on sauropods, which is great as the large theropod fauna of North Africa, including Spinosaurus, were usually thought to have fed on a range of fish. Through detailed anatomical investigations, he also provided evidence for allopatric speciation in North African sauropods, at a time when the region was cut by a large epicontinental sea. Kristi Curry-Rogers revealed to us new sauropods from Madagascar, as well as details on their evolution, ecology, and palaeobiology. One of the coolest findings was a giant hollow osteoderm, possibly used as a mineral reserve similar to modern camels! She announced the discovery of lots of new fossil sites, so the future of Madagascaran dinosaur discoveries should be exciting in the future. Philip Mannion, my PhD supervisor, launched into a comprehensive new phylogeny of Jurassic-Cretaceous Gondwanan sauropods. Phil has been conducting first hand taxonomic revision of many old and new species around the world, and has built a new tree that paves the way for new biogeographic and macroevolutionary analyses. Jeffrey Wilson described a wonderful new skull of the titanosaur Tapuiasaurus that provides insights into their feeding behaviour. This is one of the few known titanosaur skulls, and shows some unusual features including a tooth wear pattern similar to heterodontosaurs (early ornithischian dinosaurs), and the animal may have even had a keratinous beak. Diego Pol finished the session off by discussing faunal replacement in Jurassic sauropods. I didn’t catch the details on this though, as the session was running late and I had to dash to go and present my poster on the evolution and diversity of atoposaurid crocodyliforms! More on that once I’m back and have had time to recover though, although check out my recent PeerJ paper that describes a lot of what we presented. So there we have it, still lots going on and plenty to discover about the biggest animals to ever walk the Earth! If you’d like to know more, leave a comment, or get in touch with one of the authors. A new feathered dinosaur – worth getting ruffled for?